Every Finale beginner can benefit from this book. Buy It Now! 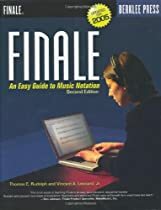 Everything you want to know about music notation with Finale! Master Finale step-by-step with the most complete how-to guide available. Designed for both novice and experienced users, this is your detailed resource to fully understanding and applying all of Finale's remarkable capabilities. Easy-to-follow instructions help you to: create publisher-quality music notation; learn to use the tools of Finale while writing your own music and arrangements; get started immediately with hundreds of professional templates, partially completed notation files, and libraries available on the companion website; print transposed parts from scores automatically; write standard notation, guitar tablature, drum set parts, and more with this comprehensive hands-on tutorial. Teachers can create warm-up and practice exercises; write their own compositions, arrangements and method books; and simplify parts for students. The companion website offers: * Tutorial Files * Samples of partially completed and finished music notation files for each of the hundreds of hands-on exercises in the book * Libraries of articulations and dynamics * Additional chapters * Professional Templates: Choral, Concert Band, Jazz Ensemble, Marching Band, Orchestra, Single Line and Grand Staff, Pit and Show, and Sketch and Utilities templates including a Cue Sheet for radio and TV. "This book excels at teaching Finale in an easy-to-understand, sequential manner. Rudolph and Leonard have loads of experience. Beginners and seasoned Finale users will benefit from what these two teach." - Tom Johnson, Finale Product Specialist, MakeMusic!, Inc.